Satisfy your hunger to sell online! PS Q1: I live outside the USA or my products are located outside the USA. Can I use Spoonfeeder? PS Q2: How can I obtain support when I am in another time zone? PS Q3: How can I contact customer support? PS Q4: What do I get on the free trial license? PS Q5: I am so busy! I do not know if selling on eBay is for me, what do you suggest? PS Q6: I do not know much about digital photography or photo hosting. Can you help with my photos? PS Q7: Where do I go to sign up? PS Q8: What makes SpoonFeeder different than other listing tools? 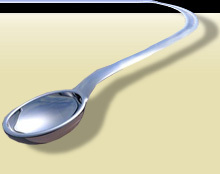 PS Q9: What is the cost to use SpoonFeeder? PS Q10: I have finished my 30-day trial and want to purchase the software. What do I do next? grayed out or don't work. What is the problem? PS Q12: I am ready to purchase a Standard, Full or Premium license but would like to learn more aobut the listing program first. PS Q13: I want to list on other auction sites or my private website, can I use Spoonfeeder? PS Q14: Will I save money on photo fees using SpoonFeeder? PS Q15: Can I use my own template with SpoonFeeder? PS Q16: Can I use SpoonFeeder with my Mac? NU Q1: I have signed up, now what happens? NU Q2 I completed the general set-up, now what do I do next? NU Q3: Why should I join the users group? NU Q4: What is an SMTP mail server and how do I set mine up in SpoonFeeder? NU Q5: I have created a listing for an item I want to sell but when I go to submit it, none of the selling sites can be selected. Access Denied". How can I save my new listing? NU Q9: When attempting to download a version update using the AutoUpdate Feature, it looks as if nothing is happening. NU Q10: I want to update or change my user information or SpoonFeeder email. NU Q11: I would like to create listings in the "design view" Where is that in Spoonfeeder? NU Q12: How do I put a specific picture in the middle of my listing? NU Q13: How do I start a default starter listing. NU Q14: How do I decide how much support to pay for? are grayed out or don�t work. What is the problem? TS Q2: There is a field I must fill in the setup asking for my SMTP mail server. What is an SMTP mail server? TS Q7: When attempting to download a version update using the AutoUpdate Feature, it looks as if nothing is happening. asterisks ("stars") displayed has increased and it no longer corresponds to the length of my password. TS Q11: I am having difficulty with the latest download. get an error message number 2109. PS Q2: How can I get support when I am in another time zone? permits. We work in the evenings (some limited nights) and on & off throughout the weekend. There is NO set schedule. Appointments are set upon request and based on availability. Spoonfeeder_help Unlike most selling software, Spoonfeeder has added flexibility. It is a two part purchase. up to eBay at your convenience. A1-7: Click this link to go to the pricing and purchase pages, even if you want to get the free 30 day trial LINK HERE. A1-9: Click here to see the pricing page. PS Q11: I have finished my 30-day trial and want to purchase the software. What do I do? PS Q12: I downloaded and installed the SpoonFeeder program but I can't seem to do anything yet and some of the functions are grayed out or don't work. What is the problem? that it may validate you and give you full access to the features of the software. PS Q13: I am ready to buy my Standard, Full or Premium license but want to wait to learn the listing program first. Is that possible? A1-13: It will be harder to get your sales records from eBay, it is easier to get started on the right foot. We will be happy to provide you with the support you need to learn to use the tools. PS Q14: I want to list on other auction sites or my private website, can I use Spoonfeeder? provide support for eBay. You can copy the HTML into other venue ads easily. PS Q15: Will I save money on photo fees using SpoonFeeder? PS Q16: Can I use my own template in SpoonFeeder? us in advance to have your template reviewed. PS Q17: Can I use SpoonFeeder with my Mac? NU Q1: I signed up, now what happens? code in your email, you will activate your account & you are ready to sell! NU Q2 I completed the general set-up, now what do I do? 1) Go into setup and go to the Listing Creator Tab. 3) Copy the information we provided you and paste it into the HTML editor. 4) To get to the HTML editor click on tools at the top and click on the HTML editor. Footer area on the Listing Creator tab. Next you will want to adapt the bidder/buyer messages the same way you did the Standard Footer. 1) Go into setup and go to the bidder/buyer messages tab. 2) Click the drop down box one at a time. Copy each one into the HTML editor. Make it your own. frequently contact its users. We post discussions of interest and announcements in our users group. When support is not available, there are many talented SpoonFeeder users that can be helpful. your internet provider for help in setting up an "SMTP Client". 2) Most people do not check the MAPI box. 3) If you have not found your SMTP server, try the button, suggest email setup. 4) The most common SMTP ports are 587 and 25. 6) You can extract this information in a similar way from other mail programs although the menus may be a bit different. locate a list of possible SMTP servers. be selected. What did I do wrong? sell using all these sites and formats. After entering this information, try exiting and restarting the program. "Web Preview and submit" tab. appropriate or recently added or updated category? categories & item specifics. If you notice something that needs to be added, please email support@spoonfeeder.com. will then submit and post into the appropriate category. the SpoonFeeder FTP, the software locks up and stops responding, and I cannot successfully upload any pictures to the SpoonFeeder server. What is wrong? the internet in order to beable to post your listings and upload your pictures. "I/O ERROR 105" or "File Access Denied". How can I save my new listing? will be included in the next version release of the software. be related to Windows XP. In most cases, the download is succeeding and the status bar is simply not being updated. the appropriate slot and submit the changes. email address information AND ERASE THE LICENSE CODE FROM IT�S BOX SO THE BOX IS BLANK. (It is saved already do not worry). 3) Now, submit your changes. email address on our website. a brand new profile, however, just alter the current profile you have existing. NU Q11: I would like to create listings in the �design view� Where is that in Spoonfeeder? NU Q12: How do I put a specific picture in the middle of my ad? to place a different picture than picture 1, just change the number. "Save Current Listing as Default Starter Listing". to the File menu and select "Save Current Listing as Default Starter Listing". * In the first 30 days of use OR during the free trial period. (take less then 5 min of staff time). Instant Message or Instant Message phone. * To be fair to all of our users, US and International, it does not matter if the question is via email, phone, Instant Message or Instant Message phone. We provide a substantial discount for buying support with your software. Do you: want 1-1 and step by step to get you going? Do you call for help rather than trying to figure it out alone? Do you think you are you good with computers? Do you learn something new & catch on quickly ? Do you follow directions from an email without further assistance? the functions are grayed out or don�t work. What is the problem? setup so that it may validate you and give you full access to the features of the software. name of your SMTP mail server you can inquire with your internet service provider, or try to extract or copy this setting from your existing and currently functioning email program. For example, if you have Outlook Express, you can usually find out what your SMTP mail server is by looking in the program menus under �Tools�, �Accounts�, �Properties�, �Servers�, �Outgoing Mail (SMTP):� You can extract this information in a similar way from other mail programs although the menus may be a bit different. Also, here is a list of some other common SMTP mail servers for common mail services. If you primarily use these mail services try the associated SMTP server setting and see if it works for you: Hotmail: mail.hotmail.com or smtp.hotmail.com or mx01.hotmail.com. The newest version of SpoonFeeder now features an integrated utility to locate a list of possible SMTP servers. including eBay Auctions, eBay Stores, and eBay Fixed price, even if you do not sell using all these sites and formats. you to select the site you desire when submitting your item for sale on the "Web Preview and submit" tab. correct or appropriate category in the SpoonFeeder category tree. How can I list my item into the appropriate or recently added or updated category? verision of SpoonFeeder you will not have the latest version of the catagories. to the SpoonFeeder server. What is wrong? included in the next version release of the software. related to Windows XP. In most cases, the download is succeeding and the status bar is simply not being updated. should not need to change your password again. the problem and how can I resolve it? 1) Close all BDE applications. 2) Find the program BDEADMIN.EXE. This is usually in a directory somewhere under "\Program Files\Borland...". 3) Run BDEADMIN.EXE and click on the Configuration tab. 4) There should be an item in the treeview on the left side called "Configuration". If it's not expanded, expand it. 5) Next, expand the System entry below it. Under System, select INIT. 6) In the right-side window, find the entry called "SHAREDMEMLOCATION". Change this value to 5BDE. 7) Next, click on the word "Object" in the main window's menu bar, and select Apply. Ready File A:/PDOXUSRS.net Directory A:/". A3-10: Problem: The BDE is trying to use an invalid path. 1) Open your Control Panel and double click the applet for the BDE Administrator. 2) Under the Configuration tab, click the plus signs to open the path to Configuration -> Drivers -> Native -> Paradox. 3) Select Paradox by clicking on it. 4) On the right panel, the first entry is for NET DIR. Change the entry from A:\ to C:\ or another valid path. you will need to exit all BDE applications for the change to take effect. problem and how can I resolve it? 8) Answer "OK" to the confirmation to "Save all edits...". A3-13: Problem: The BDE is trying to use an invalid path. of Windows 98, and I get an error message number 2109.
and load certain Windows DLLs. the Microsoft Website. Alternatively, advanced users can download the file directly from Microsoft using this link. Expression Web Beta 1. Try uninstalling Microsoft Expression Web Beta 1 to resolve the conflict. © Copyright SpoonFeeder. All rights reserved.